Following hot on the heels of our Technical Tank Tasting two weeks ago, last Monday 13th December we organized another tasting - along completely different lines. 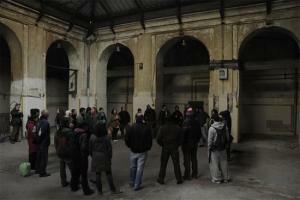 It was held in the basements (dungeons) of the former State Tabacco Factory in Madrid. And therein lies a tale! This emblymatic building was abandoned in the 1990's when the Spanish state tobacco monopoly was privatized, and there it lay for over a decade. Then last year (2009) it was squatted ('okupado') and is now used by over 50 different collectives to carry out their activites. The majority are focused on art and culture (photography, film, theatre, drawing, painting, etc) but they also do things like skateboarding, computer programming, gardening, there's a kindergarten, a library, a café-bar and restaurant, and more. And what's all this got to do with Vinos Ambiz? Well, apart from all the above activites, it's also the place where about 10 different 'Organic Produce Consumption Groups' meet. These are groups of poeple who get together in order to buy directly from different producers of all types of organic products: bread, cereals, legumes, fresh fruit and veg, milk, eggs, meat, cheese, yogurt, you name it, and of course, wine! I'm a member of one myself (BAH) and I've been delivering wine to them for years, so there was no question, really, of where to do our main tasting this year. The place is enormous and there are literally hundreds of rooms and open spaces available for activites, but even so I had to book the space for the tasting weeks ago; I was actually a bit worried that things would get out of control, due to the numbers of people in there at any given time, but everything turned out fine; maybe it was because it was a Monday, or because we were in the basement, along a long passageway and around a corner. Any way, about 40 people turned up, which was perfect for the amount of wine and number of wineglasses we brought! It was joint tasting with two producers: ourselves (Vinos Ambiz) and Bodegas Pincelada, ie the same Juan from Morata de Tajuña, who is letting us share his winery this year. The tasting was scheduled to start at 20:00, but the first guest only turned up at 20:30 (and Juan himself at 20:15); but that was OK because there was a conference happening in the room which I'd booked and they didn't vacate it till 20:30 anyway! The conference was on biodynamic agriculture and some of the participants stayed on for the tasting, even though my wines aren't biodynamic. Still working on a natural winemaker pose! So people kept on arriving in dribs and drabs, so I opened a bottle of Airén and we did a pre-tasting (strictly for quality control purposes only of course!) while we were standing around chatting and smoking and waiting. At about 21:15 a critical mass of people had arrived so I stood on a chair, rang two empty wine-bottles together and called the meeting to order! I managed to speak uninterrupted to a silent and listening audience for about 5-10 minutes. There were even a few questions which I answered and which everyone could hear. 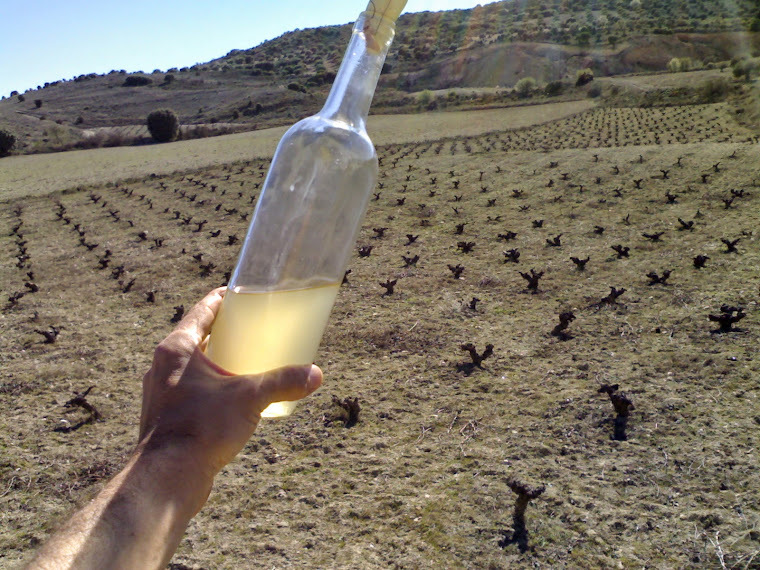 The first wine (our 100% Airén 2010) was rather cloudy in appearance, and there was a question about that. I explained that we don't filter our wines because we believe that filtering removes 'good' tasty and aromatic things, and that simply decanting the wine wine once from one tank to another is enough to get rid of any possible 'bad' things that might spoil the wine. There was also a question about why it was fizzy and tasted like champagne or cider! I answered that I thought it was because there was still some residual sugar in the wine which hadn't fermented into alcohol yet and was actually fermenting in the bottle as we spoke! Then came the second wine - Juan's 2010 Airén+Touch of Moscatel. But I lost my audience! In the time it took to pour the second wine for 40 people, they had broken up into little groups, and were all talking among themselves. If you can't beat them, join them! So that's just what I did. I circulated and chatted to lots of people and answered questions and topped up glasses. The two young reds got hopelessly mixed up, but we did manage to keep the Crianza 2006 for the last. There was one experienced taster present in the audience, who was taking written notes, and I recommended that he post them to the Adegga wine site. Who or what ate my grapes?